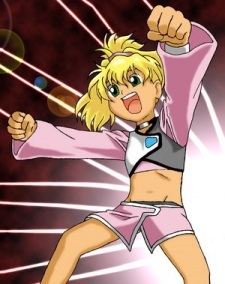 Tiki who appears to be an energetic young girl is known as the Hell's Faerie from the Kerberos base on Mars where on the thirteenth operation she decimated an entire platoon by herself. She is also known as Tinkerbell and is the twin sister of Mario. Unlike her charming and mature brother, Tiki is hyperactive, childlike and rather obnoxious, often insulting Mika for the fun of it. She is a capable Shaft driver but loses focus too easily if nothing interesting is happening around her. However, she becomes more focused toward the end of the series, when her brother dies saving the Bilkis. Tiki is the youngest of the Shaft Driver candidates. She is also Mario's little sister, a rarity in the 23rd Century. The only way you're supposed to get siblings is if there is a bug in the system. Having siblings supposedly causes you to lose focus on a mission. She's smart, hyper-active, and speaks her mind. Speaking without thinking it over first often gets her into trouble. She likes milk shakes and sweets. Mario is not only her brother, but her best friend. At first, she doesn't like Mika, but soon learns to respect her. After Mario dies, she blames Mika for his death. When she comes to terms with it, Tiki knows it wasn't Mika's fault. She seems to be on good terms with Mir by the end of the series.